Nazareth was formed in 1968 in Dunfermline, Scotland. 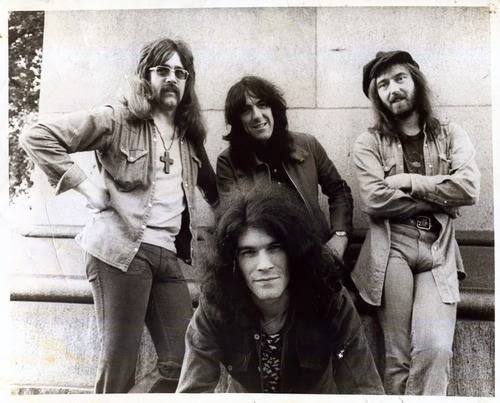 The line-up consisted of Dan McCafferty (vocals), Manny Charlton (guitar), Pete Agnew (bass) and Darrell Sweet (drums). The band were previously called The Shadettes but changed their name to suit their style of progressive rock music. Nazareth refers to the Band’s opening line of The Weight. At first the group felt constrained being limited to play covers of singles in the UK Top Thirty only by local ballroom managers. Ironically some of their most popular music included classic reinterpretations of the music of others. The group based in Scotland also felt alienated and estranged by a London-centric music industry. In 1970 they left the Belleville Hotel and Kinema Ballroom of Fife and moved to London and released their first album to general indifference. Under the management of bingo magnate Bill Fehilly they released Exercises in 1972, and played support on the Deep Purple UK tour and Rory Gallagher on his European leg. Gradually their fan base grew and when they released Razzmatazz (1973), the album spawned two UK Top Ten hits, "Broken Down Angel" and "Bad Bad Boy". Loud 'N' Proud followed soon after with their cover version of Joni Mitchell's song "This Flight Tonight," giving Naz another single success. Their record company Mooncrest was eager for more singles’ sales but the band preferred albums as was the trend of all progressive rockers. Rampant, was release in 1974, but the single "Shanghai'd in Shanghai", failed to chart in the UK. The band released My White Bicycle which became a Top 20 hit in the UK. Hair of the Dog was released in April 1975 and was produced by Manny Charlton. The title track of that album became a staple of 1970s rock radio. In the US the album contained a version of The Everly Brothers’, "Love Hurts", the US album went platinum and the single was a resounding international hit. Throughout the next two decades the line-up changed several times as the band continued to record and tour. Manny left the band in 1990 as their popularity dwindled in the US and UK. Despite this the group maintained a strong following in Germany and Eastern Europe where they continued to have hits. In 1999 founding member and drummer Darrell Sweet tragically died suddenly from a major heart attack. Lead singer Dan McCafferty eventually retired in 2013 due to ill health leaving Pete Agnew as the only original member of the group. The band continues to perform and record with Linton Osborne as its front man.